2. Idle wheel motion detector for blade jam/break shut-off. 3. Carbide giudes suitable for bimetal and carbide tipped bands. 5. Double vise jaws design, vise jaws clamp the material on both sides of the saw blade. 6. Hydraulic blade tension control. 7. 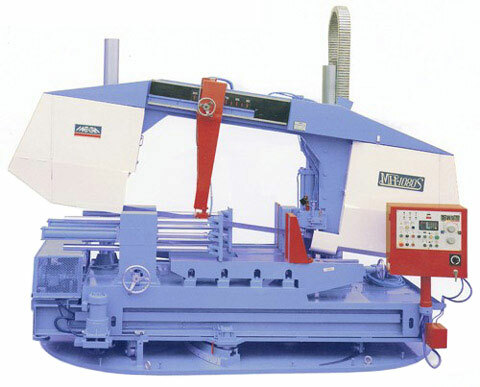 Designed with 8 tilting saw frame for optimum l-beam cutting. 8. Hydraulic cylinder drive to change angle degrees for mitre cutting. 1. Variable blade speed drive. 3. 3.3M Power Roller Table.